I always like fairytale spin-off and Cinder doesn't disappoint me at all. 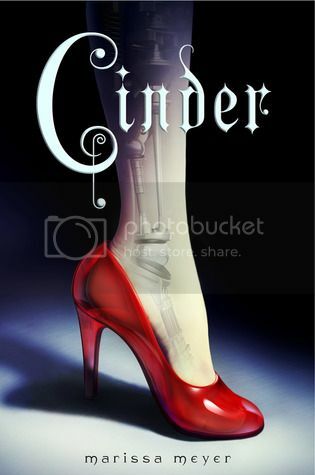 Not only does Cinder involves Cinderella, it is also about Cinderella being cyborg mechanic. How cool can it get? Of course there's an evil stepmother (Adri) and two step-sisters (Peony & Pearl) involved. Totally Cinderella like. Cinder was a cyborg mechanic who worked in New Beijing Market. It was there that she met Prince Kaito (Kai), who personally brought his android over for some repairs upon recommendation from mechanics in the palace. It was also the time where the plague known as letumosis was prevalent in the area and there was no cure for it. When one of her Peony contacted the plague, Adri sent her off to the Dr. Erland in the palace as a volunteer for some scientific research for a cure for letumosis so that Adri could claim the payout. It was useless for Cinder to resist and she was injected with the strain of letumosis and it came to a surprise when she was immune to it. Could a cure be found soon to save the ailing king? It would be disastrous if the king should fall and Queen Levana from Lunar (Yes you read that right, Lunar... moon!) would be able to exert more pressure of Kai for a marriage or some sort of union so that the Lunar would stop threatening to wage a war against Earth. To make matter worse, Queen Levana was coming to Earth... And there's a ball where Prince Kai would have to make a decision about Queen Lunar: To wed her or to deny her? Will Cinder be able to help Kai? Read Cinder to find out! 5/5 Stars for Cinder. A great and creative book that deserves to be praised. I saw another blog reviewing this book too! It sounds really interesting. Maybe I should give this book a go? Hmmm... If you don't mind the predictability of the plot and you like fairytale then go ahead! :) But it's nothing like a fairytale! This book sounds interesting. I might just give it a try when I'm up for something simple, without too much thinking involved.